Safari Tour of North India Tour trails in jeep safari on two of the highest motorable roads in the world. Beginning from the holy city of Amritsar, the jeep ride takes a tourist to the Little Lhasa - McLeodganj, the home of Tibetan refuge and His Holiness Dalai Lama. The second road trip takes a tourist to the roads of Trans Himalayan regions over high mountain passes & deep valleys providing spectacular views of snow capped peaks, rugged terrain and old monasteries. The highlights of this Safari Tour of North India include the hill stations of Dharamshala, Mandi and Manali. On arrival at Delhi Airport, meet Incredible India tour representative for assisted transfer to the hotel. Overnight stay at the hotel. Early morning check out Delhi and transfer to the railway station for your train Swarna Shatabdi to Amritsar (AC Chair Car.) Arrive in the city of holy nectar, Amritsar at: 13:25 Hours. After check in at the hotel, proceed for Amritsar city tour. 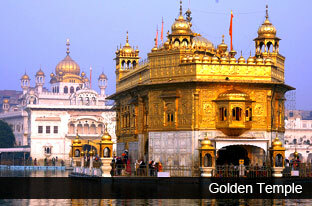 Visit the seat of Sikhism, the Golden Temple. The sacred Gurudwara is a pilgrimage for every Sikh; Golden Temple is the icon of Amritsar. It has a holy pond a dip in which is believed to purify the soul. Later visit Jallianwala Bagh, where the most notorious massacre under British rule by General Dyer killed many innocent men, women and kids. Later, return to your hotel after the visit. Overnight at the hotel. After buffet breakfast, drive from Amritsar to Dharamshala (210 KMS / 5.30 Hours). Dharamshala is the principal township of the Kangra Valley region famous for its serene aura and equally serene Buddhist cultural atmosphere. The location is a home to Tibetan community that includes the Dalai Lama himself. 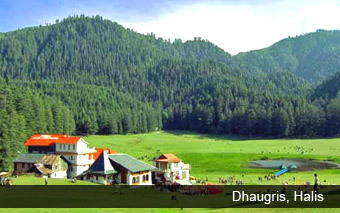 Bestowed with rich natural beauty, Dharamshala is a delight for an adventure lover. Pine forests dot the hillsides and numerous streams cut a path through them, allowing exciting opportunities for fishing. Overnight at the hotel. After breakfast, proceed for a visit around Dharamshala and drive to Mcleodganj, the upper reaches of Dharamsala. It is completely concentrated with unique Tibetan charm that yields great impact. Here, one can relish unique Tibetan cuisine, buy traditional Tibetan handicrafts and visit the Namgyal monastery. A giant prayer wheel adorns a main market and in the monastery, a serene statue of the Lord Buddha presides over the gentle chanting of the monks. The Dalai Lama also resides in Mcleodganj. Return to the hotel after your visit. Overnight at the hotel. After buffet breakfast, drive to Manali (285 KMS / 11 hours) via Mandi. En-route your drive you will stop for lunch. Continue your drive to Manali and upon arrival, proceed for check-in at your hotel. 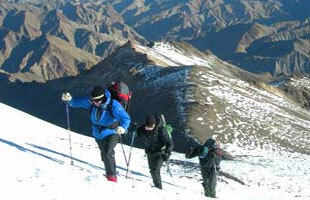 Manali is the Himalayan honeymoon capital and a favoured spot for vacationers as well. Located at an altitude of 1,929 meters, Manali exudes purity in every way and form. One should actually experience the pristine essence of Manali to actually describe what it feels to be in its divine and heavenly setting. Overnight at the hotel. After buffet breakfast at the hotel, proceed for a sightseeing tour of Manali. Manali’s main attraction is the 450 years old temple dedicated to Hadimba Devi, which has some excellent woodcarving. Visit the Tibetan Monastery, which houses several images of Lord Buddha, Thangka paintings and a handicraft centre. Overnight at the hotel. After an early buffet breakfast, you will be driven from Manali to Sarchu (approximately 240 KMS). You will stop for lunch en-route your drive. Upon arrival in Sarchu, proceed towards the campsite. Overnight at your tented accommodation. This morning after breakfast, you will be driven from Sarchu to Leh (approximately 190 KMS / 7.30 hours). Upon arrival in Leh proceed for check-in at your hotel. After buffet breakfast you will visit the Shey, Thiksey and Hemis Gompas. You will be driven 25 kilometres, south of Leh, to Thikse. Situated on a crag, overlooking the flood plains on the east bank of the Indus, the 500-year-old Thikse Monastery is one of the largest and most imposing monasteries in Central Laddakh. After buffet breakfast, you will visit the ruins of Leh Palace, modelled on the famous Potala Palace in Lhasa. Built by King Singe Namgyal, at the beginning of the 17th century, the palace consists of nine storeys rising above all nearby structures. Overnight at the hotel. Early morning transfer to the Leh airport for your flight departing for Delhi. Upon arrival city tour of Delhi, visiting India Gate, President House, Laxmi Narain Temple & Evening free for shopping. Transfer to hotel. Overnight at Hotel. Full day sightseeing of Old Delhi & New visit Rajghat, Jama Masjid, Akshardham Temple etc. Evening transfer to International airport to connect flight for onward destination.